Singer/Songwriter, DeV, assisted by musical friends & collaborators, all of whom are artists in their own right.
" For many people their first exposure to the music of While Angels Watch, the project of London based musician Dev, began in 2002 with the release of Dark Age on the French label Cynfeirdd. A fine representation of dark folk music, aided by Matt Howden and Jane Griffiths of Sieben and Ian Read of Fire + Ice. A few years later, Still The Star Shines, further enhanced their reputation in dark folk circles. However, interested listeners would have noticed from even a quick glance at the While Angels Watch discography that they had a rich history and that Dev had been active in post-punk circles stretching way back to the early eighties. Active in the squat scene of the time, he performed guitar for hardy post-punk perennials Flowers In The Dustbin before fronting his own band Tom's Midnight Garden. An early line-up of (what was to become) While Angels Watch featured Patrick Leagas, formerly of Death In June. A while later members of While Angels Watch assisted Patrick with the recording of the debut Sixth Comm album, Content With Blood, released on Eyas Media. While Angels Watch never issued any vinyl; their output was confined to three cassette releases all issued prior to 1991 in frighteningly small numbers. During 2008 a compilation of 12 tracks from the previously issued While Angels Watch cassettes | Reflection of Joy (1986) | Behind The Mists (1988) | Falling In Love (1991) | was released after a move from Cynfeirdd to the German label Eis & Licht. The CD, History & Heritage Volume I, picks up from the post-punk period and specifically from the influence of Death In June and Joy Division, taking them as a springboard for While Angels Watch to develop a sound. It's a sound that crosses into punk, electronic dance, pop and what we now know as neofolk or dark folk. A signature sound which has matured and developed through natural transition, alongside the addition of more organic instrumentation. Music still proud to retain the essence of its 1980's roots but seamlessly enhanced for the 21st Century. Where the sound will develop next we have yet to discover, as despite frequent contributions to various projects and compilations over the last few years, the forthcoming album has been delayed twice since its announcement in 2006. Artwork By [Cover] – Remedios Varo "El Flautista"
All titles written and composed between 2000 & 2002. Recorded at Redroom Studios, Sheffield, with additional vocal takes at La Rocka Studios, London. Limited edition of 588 handnumbered copies. The last words of track 10 ("... the rest is silence") are truth: Track 11 is an empty track! OUR LAST FANFARE Your statue seems to call the skies / Beckoning with tearless eyes / A winter cloak of ice and mist To freeze then shatter metropolis // As a shadow devours humanity / Kneel to the cross for a light to see / Mans time can only offend / Never will ascend / What is broke, we cannot mend // For the end will surely come / No more moon, no more sun / Death and decay rule the world / From the ash a pearl / One boy, one girl // Fire and ice, both will burn / The sound of thunder will be heard / And the human race shall cease / In this great release / We cannot tame the beast // And so the present cannot pass / Until the end creates the first / A new world of harmony / Will be our destiny / Rejoice! EYE FOR EYE You servants of false power / You who go nowhere / Just to a bottomless pit / Of dreamless sleep / Drowning us and ours / In your filth // You know what you do / And do nothing that is true / You are damaging our health You cannot redeem yourself // Murder it tastes sweet / The smell it is strong / An eye for an eye / If I took yours would it be wrong? An eye for an eye / If I took yours would it be wrong? // Eye for eye / Unsheathe the sword / Eye for eye / On the governing hoard / Eye for eye / Unsheathe the sword / Eye for eye / Time to meet your lord / Eye for eye / All those that are wronged / Eye for eye / Come join our song / Eye for eye / For those who are wronged / Eye for eye / Come join our song / Eye for eye / All those that are wronged / Eye for eye / Come join our song / A gift for a gift! SILENCE Dark shadow cast across today / Our land and people all is betrayed // The rest is silence! Remix [Remixed By] – Matt Howden, W.A.W. The tracks and artwork for this release were made available for free download from the artists official website at Winter Solstice (21st December) 2004. They were removed on 20th March, 2005. Artwork By [Cover] – Remedios Varo "El Ralejero"
Recorded and produced @ Redroom Studios, Sheffield, England on Winter 2003/4. Limited edition of 288 handnumbered copies. EYE FOR EYE You servants of false power / You who go nowhere / Just to a bottomless pit / Of dreamless sleep Drowning us & ours / In your filth // You know what you do / And do nothing that is true / You are damaging our health / You cannot redeem yourself // Murder it tastes sweet / The smell it is strong / An eye for an eye / If I took yours would it be wrong? An eye for an eye / If I took yours would it be wrong? // Eye for eye / Unsheathe the sword / Eye for eye / On the governing hoard / Eye for eye / Unsheathe the sword / Eye for eye / Time to meet your Lord / Eye for eye / All those that are wronged / Eye for eye / Come join our song / Eye for eye / For those who are wronged / Eye for eye / Come join our song / Eye for eye / All those that are wronged / Eye for eye / Come join our song / A Gift for a gift! This release contains material from three cassettes released between 1985 and 1990. The quality has been digitally enhanced and mastered. Limited edtion of 525 copies. The release contains a 16-paged booklet. Part three in the Eis & Licht Document series. "This is a document, not a reinvention, presented here as it is - when it was. While Angels Watch... a dark mirror to the post industrial, post punk, anarchist squat scene of London in the early 1980's. This is fruit of those days; when it was more about action than song. But song there was... The music produced during this period had been described by the band as Death Disco... developing alongside the first Apocalyptic Folk acts and European dance music. Included here is a selection from the back catalogue originally distributed over three cassettes between 1986 and 1991. The quality has been digitally enhanced and remastered, but nothing has been added... for better, or for worse, this was While Angels Watch in the 1980's. I am proud to issue this volume for the curious who have asked and as a homage to the artistic roots of this project. Those who assisted were: Dougie Graham/Douglas Mirren, Alan Griffiths and David Horton. I hope you are each where you want to be." SHADOW OVER SHADE If we weren't held from strings / I could rise above those things / That pull me down / Where do we go now? / We've taught each other how / To kiss the ground / I can't keep the wolf from your door / You can't keep me this side of the grave / Everything we do falls short / A failure and a charade // There's something in the air / That leaves me in despair / When you hear me wrong / Is there any trust / To crush into dust / Now that day is done? / Watching you melt into tears / Sensations that do not belong come rushing in / But I'm the bones at the feast / When I see you try so hard to repress a smile // What is it that ever is, what is it that ever was? KILL Where are you? Sadie, where are you? I need you Where are you? I'm hypnotised at the gate / I'm in a trance and I wait / I've found the strength to unleash my will / You lived in fear tonight you shall live in pain / Will you tell? Sadie Will you tell? 6 panel Hi-Gloss digipak with lyric booklet! [Review by Tony Dickie for Compulsion Online Magazine] 2017. A layered, complex and epic recording. The strident acoustic strum of 'Voices' that opens Interregnum rises from a collage of samples, with Dev's heavy set baritone ruminating on the malaise caused by the constant babble of opinions spouted by politicians, the media and even the public staking out their claims and counter claims. The entire track is riddled with backward electronic treatments, the acoustic strum propelled by passages of surging guitars and low bass runs, ending on a series of juxtaposed samples of those blabbering competing opinions. 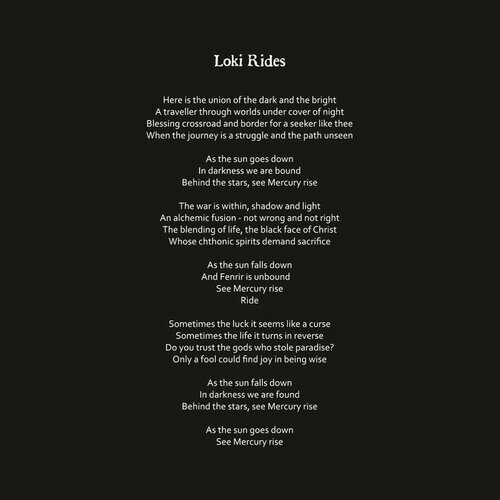 It settles into 'Loki Rides' draping Dev's slow drawled melodic tones over acoustic pluck and strum. A song for the seeker, emboldened by passages of layered guitars, keyboards and wind chimes adding texture to the maudlin atmosphere. "See Mercury rise" Dev cries over alternate sun based and star sprinkled lines in a track steeped in mythology. 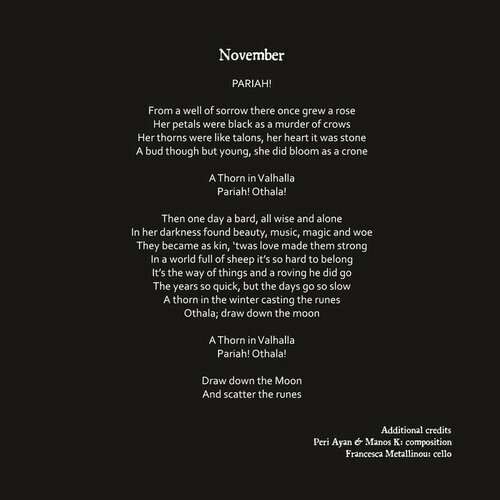 The runic centred 'November', with music composed by Peri Ayan and Manos K of Mani Deum, reads like a short story, and is musically separated into distinct sections from the opening early Sol Invictus acoustic strum to the cello driven section with its runic intonations: "A Thorn in Valhalla, Pariah! Othala!" and then into the main lyrical body of the song comprising rousing strum and cello sweeps, played by Francesca Metallinou from Decemberance. It builds into a powerful ensemble piece repeating the runic chant as guitars, cello, drums and synthetic strings surround the voice of Dev, his commanding tones imploring us to "Draw down the Moon, And scatter the runes". 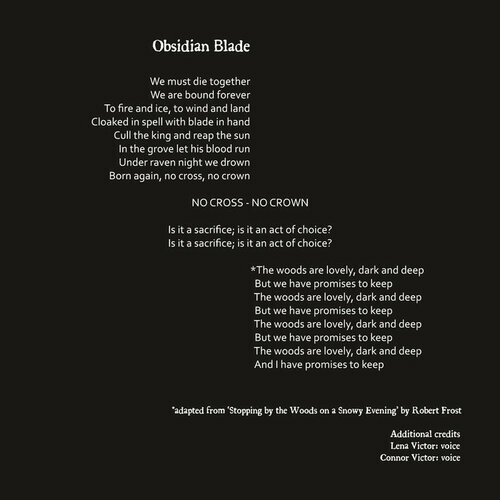 'Obsidian Blade' features a spirited performance of quick strum, pounding bass and drums and syncopated trumpets, dissolving into wind chimes, electronic treatments and samples (I spotted a couple from The Wicker Man), resurfacing into atmospheric almost pastoral realms where a flute gives way to a convergence of voices who in unison slowly recite text adapted from the Robert Frost poem 'Stopping by the Woods on a Snowy Evening'. It's not the only track here to adapt text. 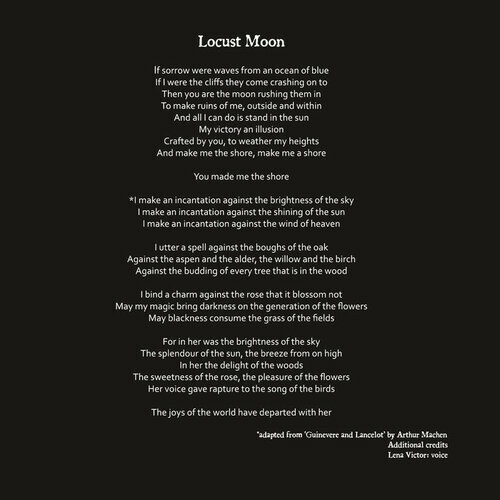 From field recordings of lapping water 'Locust Moon' flows into an acoustic ballad where Dev's sung and spoken word delivery captures a feeling of heartfelt longing to a love lost and hopes dashed. A mass of voices enter and fall away to leave Dev alone intoning words continuing this adaptation of Arthur Machen's 'Guinevere and Lancelot'. Both songs, like many of the tracks on Interregnum, continuously change shape and direction amply illustrating the amount of effort that went into this recording, that comes over a decade since their last release of original material. 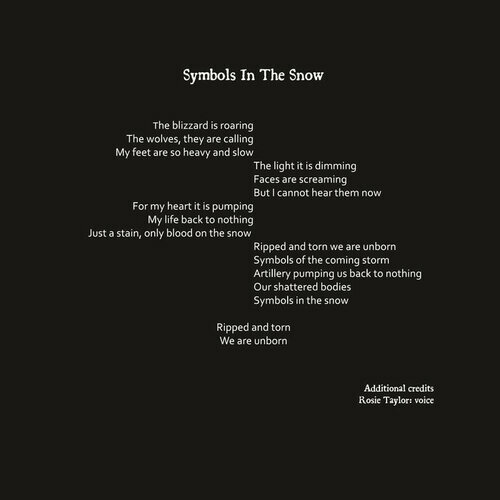 'Symbols In The Snow' - a title that appears to have slipped through Death In June's lyric generator - unfurls to intricate guitar notes and recurrent bursts of drum rolls. War themed couplets are deployed in almost spoken tones, as this sombre ballad swells with light keyboard flourishes and cooing female accompaniment. "Ripped and torn, We are unborn" a chorus of voices sing coalescing around the lead vocals before falling back into the windswept atmospherics of the following track, 'Winter'. It foregoes guitars for icy tones; its weeping synths overlaid with fingerbells and ghostly harmonies. A sense of resignation hangs heavy around this one; peace seemingly only attainable with death. 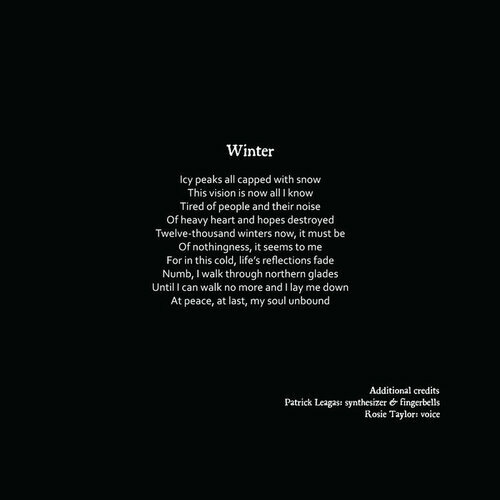 Those aware of the work of While Angels Watch will know that Dev was part of an early formation of Sixth Comm, so it's perhaps of no surprise that Patrick Leagas features on 'Winter'. The compositional arrangement of 'Sound of War' seems to share an affinity to the experimental rhythmic work found on 6 Comm's Headless too. Based around shakers, light keyboards and drums as a backdrop to Dev's powerfully commanding voice, it offers a sparse martial setting of a track originally written and recorded by Gitane DeMone - and those expecting a celebration of war may be surprised by the sentiments contained within. Guitars are recalled for much of the rest of Interregnum. 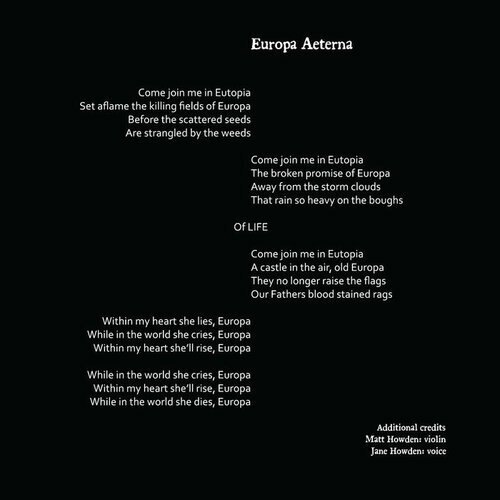 Violin and voices soar on 'Europa Aeterna', a lament to a lost Europa, and its forgotten ideals and thwarted possibilities. You could even read it as a swansong for Brexit, a decision taken by the UK electorate who chose to sleepwalk through the EU exit door - and that's my take which isn't necessarily a view shared by While Angels Watch. Here While Angels Watch are joined by long-time collaborators Matt and (the late) Jane Howden of Sieben who also guest on the following track, 'The Watcher'. 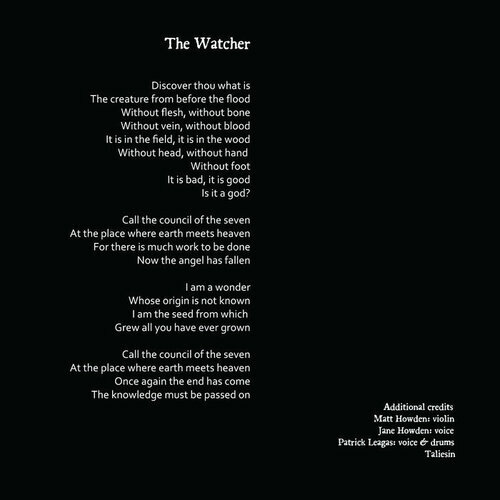 Flitting between solo acoustic verses and musical passages and choruses coupling a soaring violin score from Matt Howden with the voices of Jane Howden and Patrick Leagas - who also adds drums here - 'The Watcher' is an understated ensemble delight. While much of Interregnum falls into the realm of what could be considered a midlife existentialism, the final two tracks offer searing indictments of the modern world. 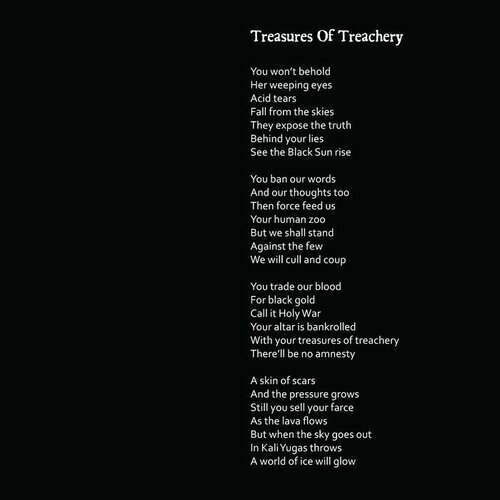 The stirring dark folk of 'Treasures Of Treachery', issued as a taster of the album, is an impassioned call to arms against governments who indulge in conflicts under the pretence of a "war on terror". But behind their shady veneer lies unabated industrialisation and profiteering leading to worldwide environmental destruction. 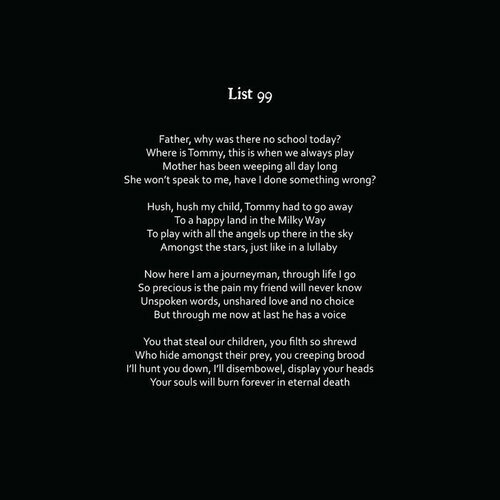 The final track 'List 99' which takes its title from a register of names of those banned from working with children doesn't hold back either. From its lullaby-esque opening this track dealing with paedophilia and child killers drifts off into a melange of electronic samples and treatments, listing names forever tainted amidst rhythms and surging guitars. If you're looking for reassurance, look elsewhere as 'List 99' acts as a brutal, bitter denouement to Interregnum. Interregnum was years in gestation and it shows; it is an epic journey both musically and topically in its lyrical concerns. Since the release of 'Dark Age' and 'Still The Star Shines' Dev's voice may have aged, grown deeper and more world weary but Interregnum remains a defiant and impassioned release. There's a lot to digest, within songs that continually shape-shift and deal wrestle with issues both big and small, but Interregnum represents a highpoint within their discography and it marks a welcome return for While Angels Watch. Lyrics/Music written, performed and produced by Michael DE Victor at Sowilo Media [UK] aided by Matt Howden [Redroom, UK] and Stefan Traunmuller [SoundTempel, Austria. 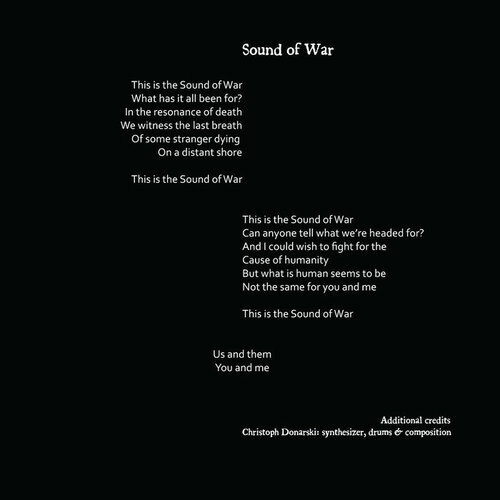 [See Lyric Booklet for additional Credits]. "Words Writ In Dust captures a rare live performace of While Angels Watch at the 28th Anniversary Party of London's legendary alternative venue Slimelight/Electrowerkz on 17th October 2015. The show being the final night of the Runes Writ In Rust European tour by US artists Awen and Et Nihil, who both performed in the UK for the first time. The concert was dedicated to John Murphy who sadly passed away earlier that week, and so this release is in turn dedicated to the memory of our much missed friend. Funding from this download will culminate in a professionally mastered physical release. The performances by Awen and Et Nihil appear on the limited edition vinyl 'European Crusade' released by Folkworld, Germany. *Please note, minor glitches caused by peaking and occasional volume inconsistencies are from the live soundboard mix and not post production. Artwork design Michael DE Victor, Logo adaptation Frank Geens"